It always seems to happen this way. Last week the title of my weekly missive was, "All is not right with the world." The key point I wanted to make was that while the U.S. stock market looked to be in pretty good shape, the world markets were not. And since the best bull market runs tend to be global in scope, I thought it made sense to alert readers to what I perceived to be an important risk factor. So, what did Ms. Market do with my global macro warning? Step lively to new all-time highs, of course - LOL! Such is the game we play and one of the primary reasons I don't believe in trying to make "calls" on what is about to happen next in Ms. Market's game. I've been in the business of investing since mid-1980 and I can say with absolute certainty that no one has been able to consistently "call" the next move in the market for any length of time. Sure, I could hammer away at the keyboard this morning and 'esplain' that these types of divergences tend to occur late in the cycle and that we should keep our eyes peeled for trouble ahead. I could point to any number of scary numbers to make myself feel better about my "warning." I could even go so far as to say that I will be "right" in the end. But here is a lesson I learned from Ned Davis a LONG time ago. Unless you make your living selling advertisements (which requires consistent "eyeballs" on your musings and everybody in the publishing business knows that fear sells), the business of investing isn't about "being right." No, it's about "getting it right" and "making hay while the sun shines." And make no mistake about it; with the S&P 500 closing the week at a fresh all-time high, the sun appears to be still shining on the stock market. Again, I could sit here and opine that there are storm clouds gathering on the horizon. That might make my recent urgings toward "some caution" a bit easier to take. But here's the problem. My "State of the Tape" model remains in great shape. 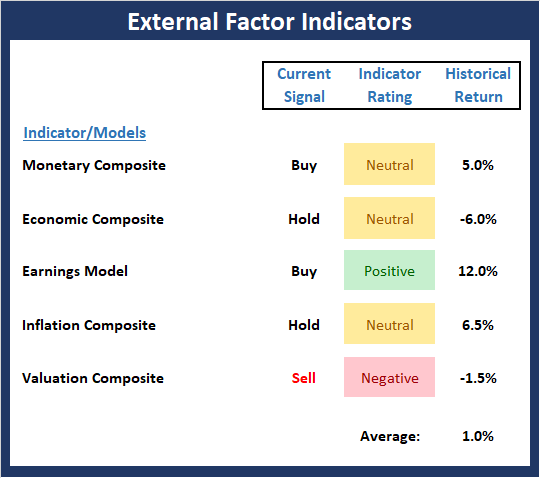 And both my "Desert Island" and "External Factors" models (all three models are shown in the Primary Cycle Board below) flashed buy signals last week. Although the signals occurred by the skinniest of margins, my rules-based approach to investing tells me to "check your ego at the door" and get in line what the indicators say "IS" happening. To be sure, this can get uncomfortable at times - especially as we enter what is historically one of the seasonally weakest periods of the year. But as I have also learned over the years, the more angst I feel about making an adjustment to my exposure in the stock market, the more likely the move is to be profitable. (Insert laughing/crying-eyes emoji here!). To clarify, I added "some" exposure to the stock market in response to the signals from my "Desert Island" and External Factors models. As you likely know, I don't believe in putting all of my portfolio management eggs in any single indicator basket. No, I prefer to employ a "team" approach by using a group of indicators/models. The idea here is that ALL indicators/models stumble or "get fooled" by the action at times. As such, I want to limit my exposure to what I call the "singular failure" of any one model/indicator/signal. The bottom line is my battle cry is to try my darndest to get it "mostly right, most of the time" in terms of the market's risk/reward environment. In other words, I want to manage money in a way that limits the opportunity to make "the big mistake." To do this, I need to remove emotion and create rules to follow. Again, this is NOT a single "holy grail" indicator that I dreamed up and I alone have access to that allows me to buy the bottoms of market declines and sell the tops of bull moves. Just so we are clear, I believe such a task is a fool's errand. No, I prefer to have a team of indicators designed help me stay on the correct side of the prevailing environment. And with four of my five "Primary Cycle" models on buy signals, there can be little argument that the bulls are in control of the game here. Does this mean that stocks will dance merrily higher from here? Frankly, I doubt it. Gun to the head; I think the choppy, news-driven environment is likely to stick around a while. The President's legal issues are troubling and aren't likely to go away during the mid-term election season. Despite the two sides talking, there was no improvement in the state of the trade war with China last week. And while Jay Powell did sound a bit more dovish in his speech at the Jackson Hole symposium on Friday, Powell's merry band of central bankers is still likely to keep pushing rates back to the neutral zone. But with consumer spending looking strong, the economy humming along, earnings at all-time highs, and a couple of my favorite models flashing buy signals, I simply can't be overly negative at this point in time. So, while I still believe that "some" caution is warranted (as in, stay away from the margin account for now and maybe keep a little powder dry on the sidelines for opportunities), this week's action is clearly a step in the right direction. Believed to be unique in the industry, the Elevation strategy is a long-term, risk-managed portfolio solution designed for growth-oriented investors seeking a tax-efficient, risk-managed approach to the stock market. Our tests show that 75% of the Strategy's profitable trades since 3/31/1999 would have qualified as long-term for tax purposes. 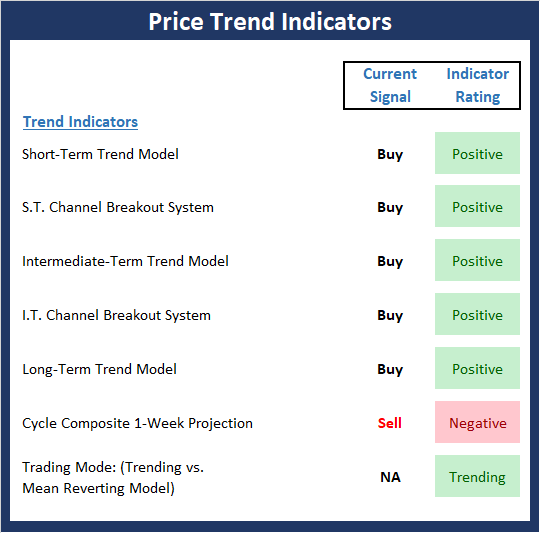 I like to start each week with a review of the state of my favorite big-picture market models, which are designed to help me determine which team is in control of the primary cycle. 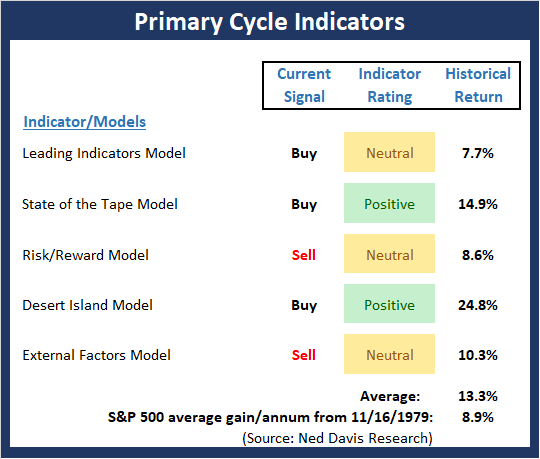 The good news for the Primary Cycle board this week is both the "Desert Island" model (the model I would choose if I were stranded on a desert island and only had access to one indicator) and the External Factors model both flashed a buy signal and moved up into the positive zone (albeit by the slimmest of margins). And despite the Leading Indicators model slipping back into the neutral zone, the historical return for the S&P 500 given the current model readings is solidly above the mean. The Trend Board remains in good shape. However, we should note that the cycle composite now turns down for the seasonal weak period. In short, a choppy downtrend is now projected until mid-October. The Momentum board showed some much-needed improvement this week and the historical return of the current state of the board is well nearly double the historical mean. 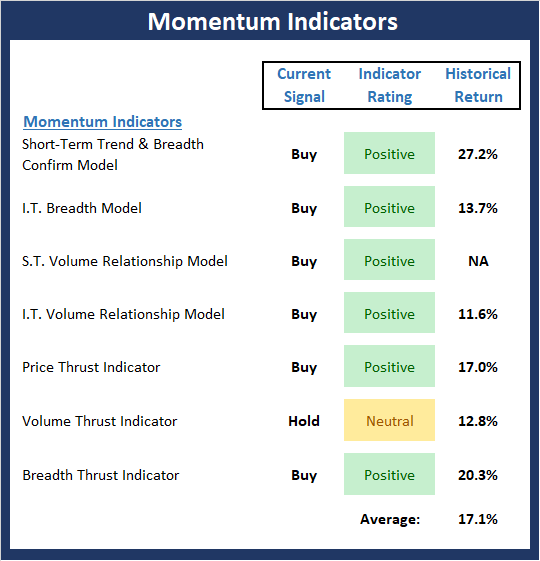 But (you knew that was coming), while the "thrust" indicators are in better shape, we have yet to see longer-term "thrust" buy signals, which historically have given the bulls an "all clear" signal for the coming 12 months. But for now, things are in good shape here. The "Early Warning" board is largely neutral at this stage. 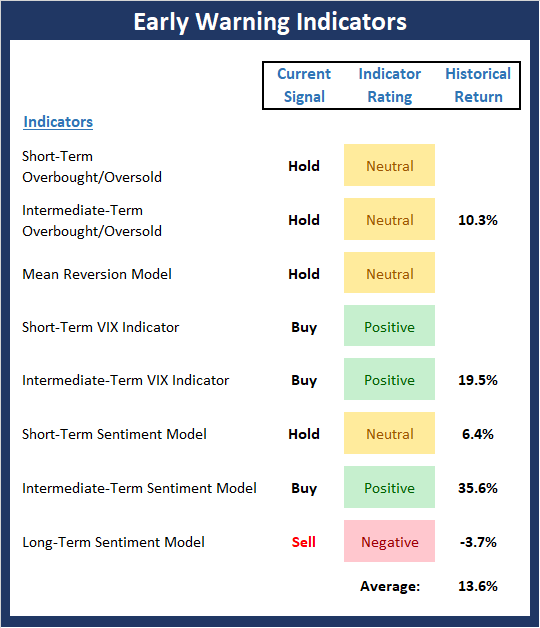 However, I'll note that the intermediate-term sentiment model flashed a buy signal last week. This is interesting given that stocks notched all-time highs. While it is hard to see, the External Factors board improved again this week as the Monetary Composite upticked, which pushed the historical return from negative to positive. It is also worth noting again that the Inflation Composite model is now neutral, which is a good thing for bond investors. But, as I've been saying, there can be no denying that External Factors board leaves a lot to be desired here.